When going too far is barely enough. 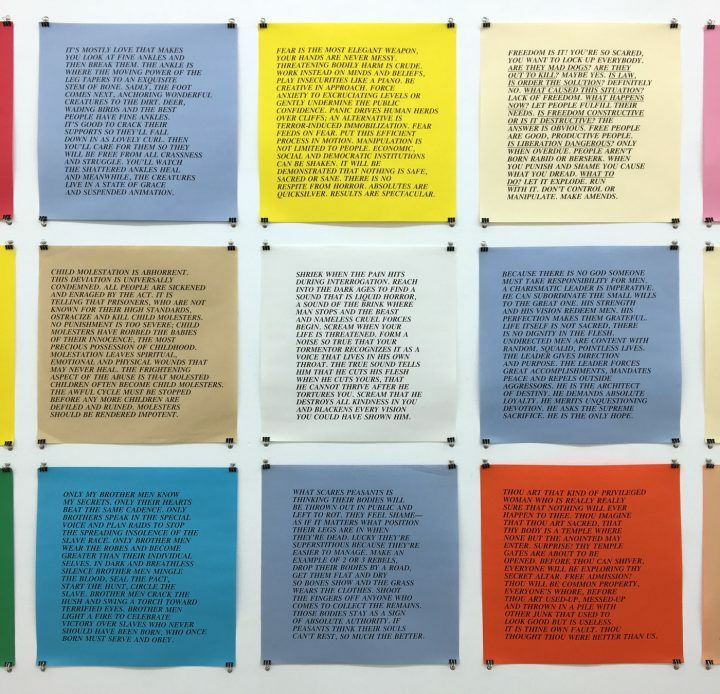 Jenny Holzer first published her Inflammatory Essays in 1977 — square sheets of colored paper printed in all-cap italics — by pasting them on walls, lamp posts, construction sites, and other open-air arenas of public debate. That year marked the beginning of the ill-starred presidency of Jimmy Carter, when New York City, overrun by drugs and crime, notably careened from the depths of a fiscal crisis to the chaos of a 25-hour blackout and the Son of Sam shooting spree. IT’S ALL GOING TO BURN, IT’S GOING TO BLAZE. IT IS FILTHY AND CANNOT BE SAVED. A COUPLE OF GOOD THINGS WILL BURN WITH THE REST BUT IT’S O.K., EVERY PIECE IS PART OF THE UGLY WHOLE. THE OLD IS SOILED AND DISGUSTING BY NATURE. STALE FOOD IS REPELLENT, MONOGAMOUS LOVE BREEDS CONTEMPT, SENILITY CRIPPLES GOVERNMENT THAT IS TOO POWERFUL TOO LONG. YOU ARE TOO DEPRAVED TO REFORM, TOO TREACHEROUS TO SPARE, TOO HIDEOUS FOR MERCY. RUN! JUMP! HIDE! PROVIDE SPORT FOR THE HUNTERS. Over the top, until now. 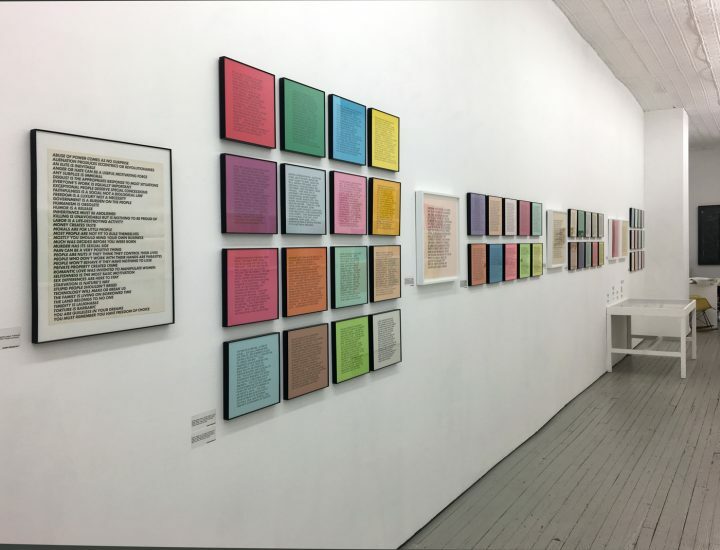 Alden Projects on the Lower East Side has responded to the election of Donald J. Trump by presenting Holzer’s Inflammatory Essays, along with Truisms, her series of posters from the same period, more than 100 items in all, in a show called REJOICE! OUR TIMES ARE INTOLERABLE: Jenny Holzer’s Street Posters, 1977-82. TAKE COURAGE, FOR THE WORST IS A HARBINGER OF THE BEST. ONLY DIRE CIRCUMSTANCE CAN LEAD TO THE OVERTHROW OF THE OPPRESSORS. THE OLD AND CORRUPT MUST BE LAID TO WASTE BEFORE THE JUST CAN TRIUMPH. MANIPULATION IS NOT LIMITED TO PEOPLE. ECONOMIC, SOCIAL AND DEMOCRATIC INSTITUTIONS CAN BE SHAKEN. IT WILL BE DEMONSTRATED THAT NOTHING IS SAFE, SACRED OR SANE. THERE IS NO RESPITE FROM HORROR. ABSOLUTES ARE QUICKSILVER. RESULTS ARE SPECTACULAR. What is remarkable about these texts — and what foretells the complex and enigmatic artist Holzer would become — is that their extremities of idealism and abhorrence, compassion and vengeance, analysis and absurdity consolidate into a moral directive within their own amoral universe, aka the realm of art. As stated on the gallery website, the artworks’ texts are “drawn from far-flung sources, including Emma Goldman, Lenin, Hitler and Valerie Solanis [the would-be assassin of Andy Warhol], but which are strategically distilled into an anonymous, non-unitary voice.” Holzer’s undifferentiated fusion of communism, fascism, and anarchism unsettles the reader even without knowing the derivation of the material; the awareness of it is all the more disturbing. What should give us pause is not what Holzer says in these texts but what these texts say about us — the harrowing wages of repression and ignorance, the hollow gains of superiority and arrogance, the ubiquity of willful blindness and the thunder-flash of blind rage. Holzer invokes in these works the lurid madness of biblical prophets from Isaiah to John the Evangelist, pouring out her own incantations, not via divine inspiration, but through a ruthless criticism of everything existing (to invoke Karl Marx). 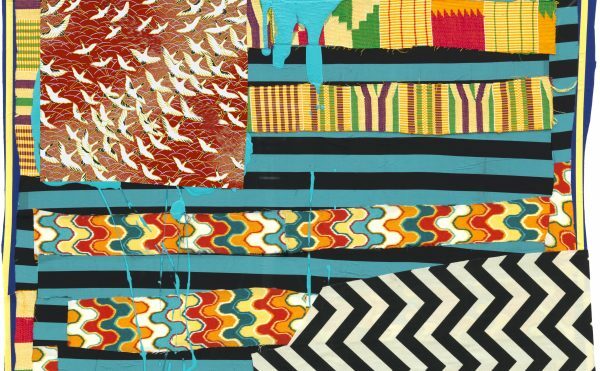 Such a critique presumes a ruthless process of self-examination on the part of the artist who, through the rigors of imagination and insight, bores through the floor of her own loathing into the subbasement of our own, where we are left to contemplate the face of Trump lurking behind one of our many masks. REJOICE! OUR TIMES ARE INTOLERABLE: Jenny Holzer’s Street Posters, 1977-82 continues at Alden Projects (34 Orchard Street, Lower East Side, Manhattan) through February 12.